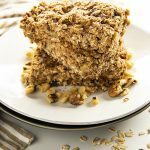 These homemade granola bars are sure to become a favorite breakfast and snack your whole family will love. Enjoy every healthy bite! After making these the first time, my kids and husband told me not to buy the packaged ones anymore. 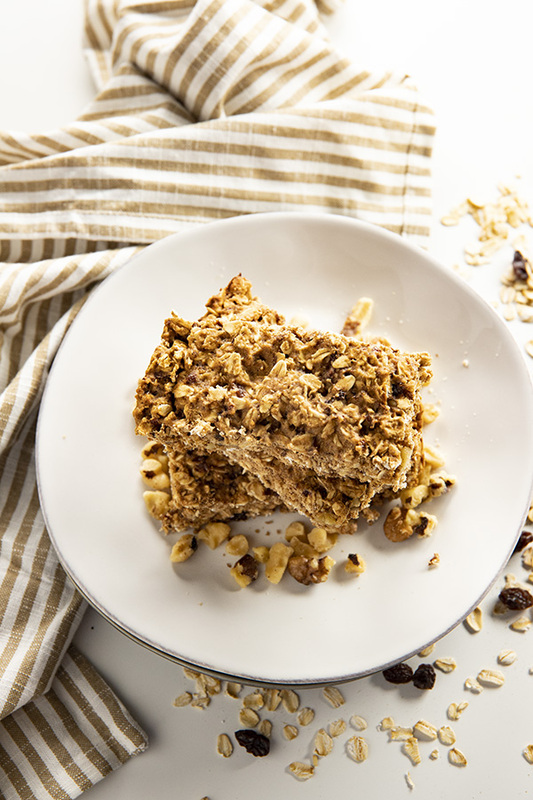 These bars are so delicious that you will forget you’re eating something healthy. 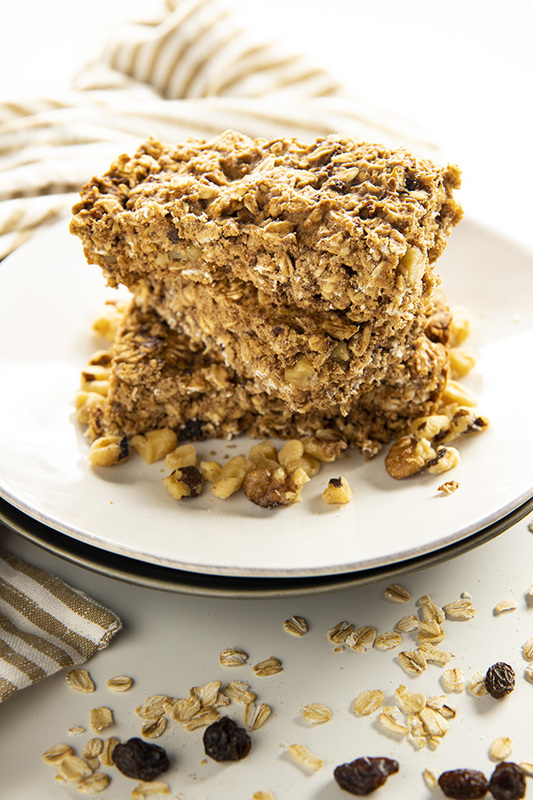 Great as a grab n’ go breakfast, school and after school snack and late night with a hot cup of tea. I wrap them individually then toss them in freezer bags. Anyone who wants one can just grab and either heat in the microwave for a few seconds or wait a few minutes for them to thaw out. I like them from the freezer. Great warm from the oven to frozen. 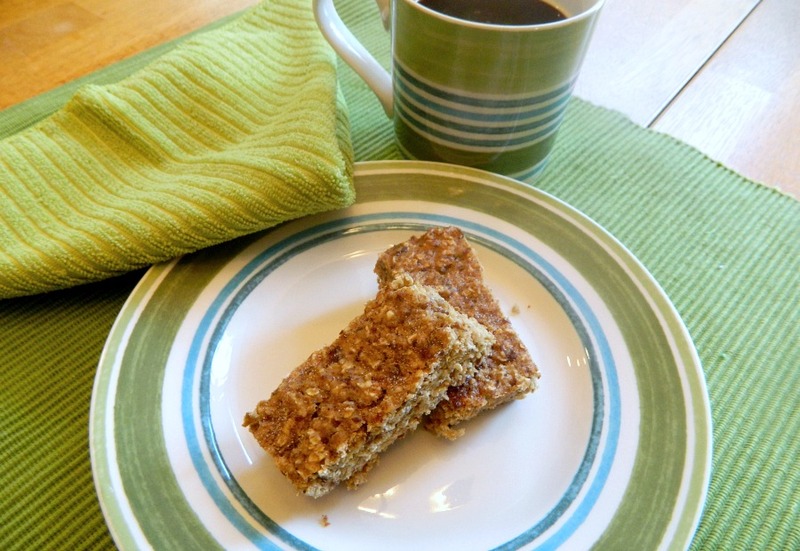 A super granola bar that’s sure to be a hit with everyone you serve them too. Place the raisins and water in a glass measuring cup and microwave for 1 minute. Mix the raisins so that they absorb the water. In a mini chopper, blend raisins until smooth. Pureeing the raisins intensifies their sweetness and gives the bars a lot of moisture. If you don’t want to puree the raisins, that’s Ok; just add them to the batter. Add the raisin puree to the wet ingredients. In a separate bowl, whisk the flours, baking soda and cinnamon. Add the dry mixture to the wet mixture, and add the oats and walnuts. Mix everything together. Spread batter onto a 9 x 13 baking dish that has been sprayed with cooking spray. Preheat oven to 350 degrees. Bake anywhere from 20 to 23 minutes, until light brown. You can test with a toothpick (it will come out clean or with moist to dry crumbs when ready). Before cutting the bars, let them cool. Cut into 24 bars. 1.Place the raisins and water in a glass measuring cup and microwave for 1 minute. Mix the raisins so that they absorb the water. 2.In a mini chopper, blend raisins until smooth. Pureeing the raisins intensifies their sweetness and gives the bars a lot of moisture. If you don’t want to puree the raisins, that’s Ok; just add them to the batter. 3.Add the raisin puree to the wet ingredients. 4.In a separate bowl, whisk the flours, baking soda and cinnamon. 5.Add the dry mixture to the wet mixture, and add the oats and walnuts. Mix everything together. 6.Spread batter onto a 9 x 13 baking dish that has been sprayed with cooking spray. 7.Preheat oven to 350 degrees. Bake anywhere from 20 to 23 minutes, until light brown. You can test with a toothpick (it will come out clean or with moist to dry crumbs when ready). 8.Before cutting the bars, let them cool. Cut into 24 bars.